Figgy Duff is a pudding made of molasses found right in the middle of a traditional Newfoundland Jigg’s dinner, as well as a local folk rock band. While, Dory is a fishing boat and one letter away from Janalyn Petten’s mom’s maiden name. The two words combined make Figgyduff Dory, Petten’s own interpretation of the inspiration she finds surrounding her. It’s a online clothing company ran out of Port de Grave, which Petten operates on her own. It features artistic graphics backed by well-known Newfoundland sayings, rural NL town, familiar landmarks and wordplay. The artist grew up in rural Newfoundland and felt compelled to include pieces of the island into her work. Influenced directly from the land, tradition, folklore and history, the province has been the template for Figgyduff Dory. Petten creates all the designs on her own, different shaped drawings and font give a whole new life to the familiar words of Newfoundland. 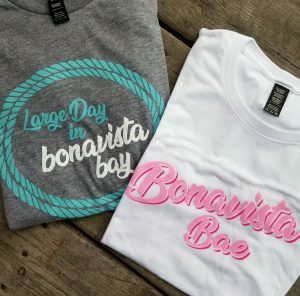 Like the cheeky play on words in the “Bonavista Bae” tee or the “Brigis is always a good idea” tee lined carefully with blueberries. When she first started, she printed each piece herself. As things picked up, Petten began contracting local businesses to help with the heavy load, while also producing from her own machine. Needless to say, the reaction to FiggyDuff Dory has been received with many open arms and sometimes great laughs, especially when someone reads a “One, Two, Tree” onesie. 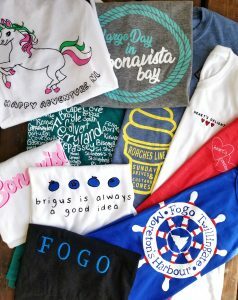 Most Newfoundlanders can easily spot a Figgyduff Dory Tee or two as they scroll through their personal social media. Spotting her own work is still a vision that surprises Petten. 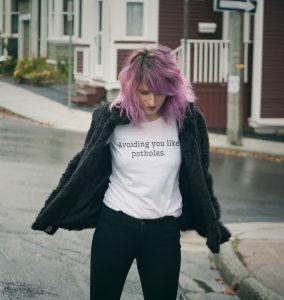 Similar Newfoundland sayings can be found through a variety of design pieces for purchase online. 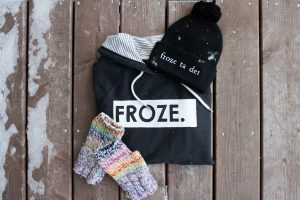 Toques staying “Froze ta det” and unisex Tees featuring “Don’t be talking,” common sayings that only a true Newfoundlander can explain. 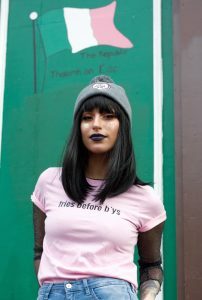 Most customers order from the Figgyduff Dory site but Petten’s clothing is featured at some retail venues, and she tries to attend local fairs. 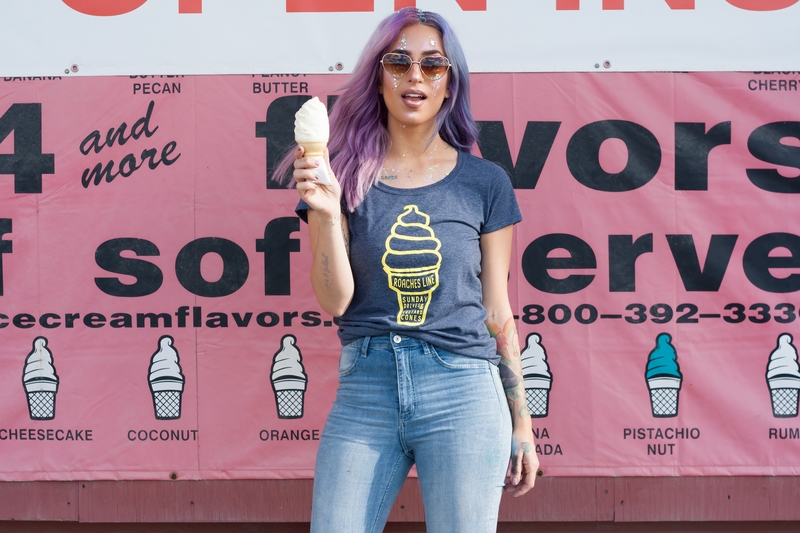 Petten has ordered some new winter designs and says to expect to see some crewnecks in the near future, while she has some spring designs ready to go. For a unique piece of home, with an artistic twist in the sayings we all love and use, check our Figgyduff Dory online. 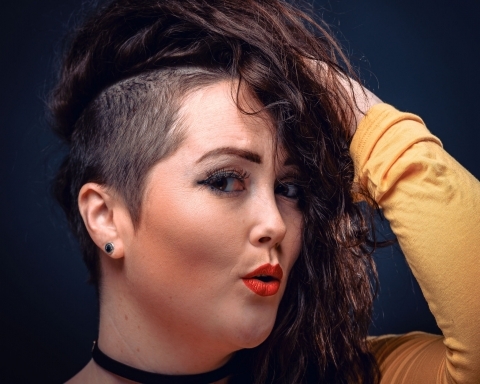 Next Story Next post: Hold onto your wigs: Bob the Drag Queen is coming to town.